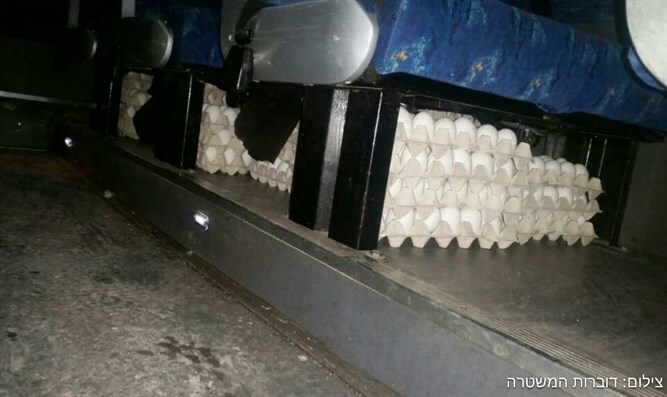 Security check reveals cartons of unauthorized eggs in minibus. Border police foiled an attempt to smuggle 300 trays of eggs into Jerusalem on Sunday evening. The eggs were discovered when Border Police, acting on intelligence received from police in Judea and Samaria, conducted a security search at the Hizma checkpoint in north Jerusalem. The search revealed 300 trays containing 9000 unapproved and unstamped eggs, which were being kept in unsuitable conditions. Israel's Agriculture Ministry was alerted and brought to examine the eggs. This is not the first time Israeli authorities have had to deal with Arabs smuggling unauthorized eggs into Israel. In 2015, Israeli authorities arrested members of a large egg smuggling ring, and later that year seized 25,000 illegal eggs after they were feared to carry salmonella.